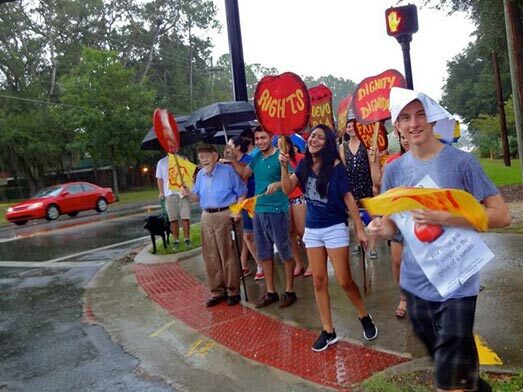 The Publix Truth Tour launched yesterday with a dramatic send-off from some of the CIW’s most stalwart allies in Gainesville. 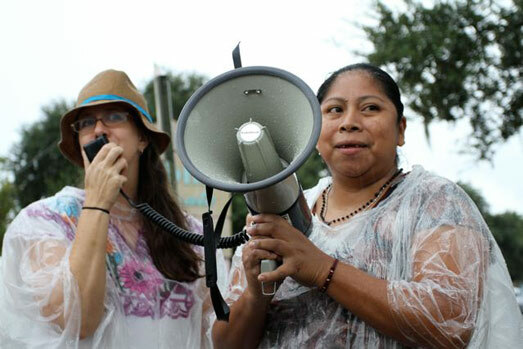 The partnership between Immokalee and Gainesville is so strong, in fact, that the day’s activities marked not only the beginning of the Truth Tour, but also the culmination of the city’s annual “CIW week,” a full seven days of local education, activities and action to call for fairness in the fields. After spending the morning with the adult Sunday School class of Trinity United Methodist Church and the combined youth groups of United Church of Gainesville — followed by an official welcome to Gainesville with a thirty-person potluck hosted by the indefatigable Interfaith Alliance for Immigrant Justice at the Emmanuel Mennonite Church — the Fair Food community of Gainesville gathered for a press conference and march to a nearby Publix. 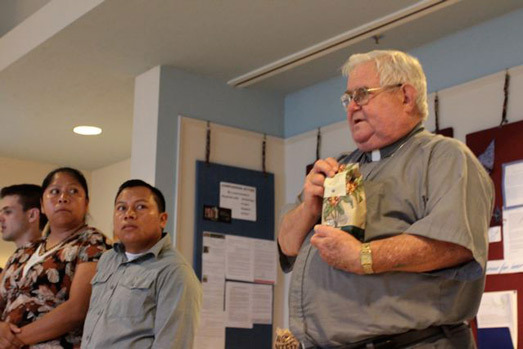 Eighty five supporters packed the foyer of Westminster Presbyterian Church as the CIW’s Lupe Gonzalo and Oscar Otzoy began by explaining what had propelled them to undertake this two-week tour. In a tone steadfast and resolute, Lupe underscored the power of the Fair Food Program in addressing the sexual harassment that has for decades been the “daily bread” of women in the fields. “Women finally have an effective mechanism to report abuses without fear of retaliation,” she stressed. “But not only that, they can be assured that an assailant will be banned from the industry” — a dramatic departure from a culture long thought to be too deeply entrenched to uproot. This, she explained, is what Publix actively chooses to undermine. And then, just as the press conference closed, the skies opened and a downpour commenced. 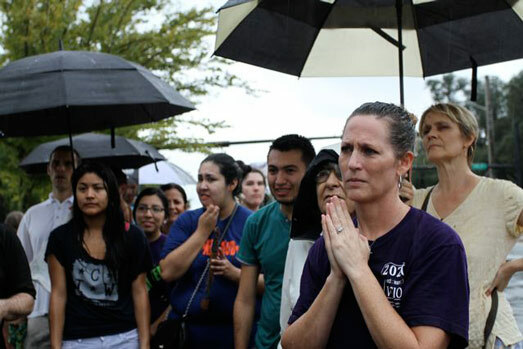 But the now-100 gathered didn’t skip a beat, setting out toward Publix almost as though they hadn’t noticed the heavy rain. With a sizable contingent from UF’s CHISPAS leading chants, the intrepid marchers kept on for over a mile before arriving at the high-traffic Publix and forming their roving picket. Though colors of newly hand-painted signs bled together and t-shirts soaked through, not even the relentless showers could dampen the crew’s animo. Upon returning, Rev. Larry Green of Westminster Presbyterian Church addressed the crowd and shared his exasperation with the management’s lack of respect for the delegation. 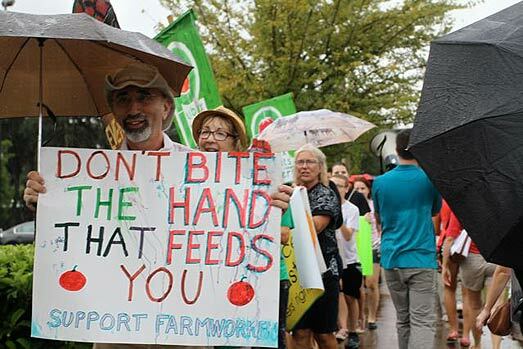 “They don’t appreciate us as individuals, they don’t appreciate you as workers, and I don’t think they deserve our money any longer.” Agreement rippled through the crowd. 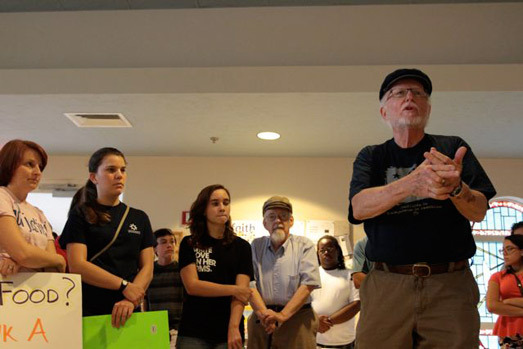 And as the day came to a close, Gainesville community members congratulated each other on a CIW Week well done and wished the Tour crew well on the rest of the two-week Publix Truth Tour. You can watch a very nice local TV report on the protest here. And check back soon for the next update from the road, as the Publix Truth Tour hits Raleigh, Durham, and Chapel Hill, North Carolina!